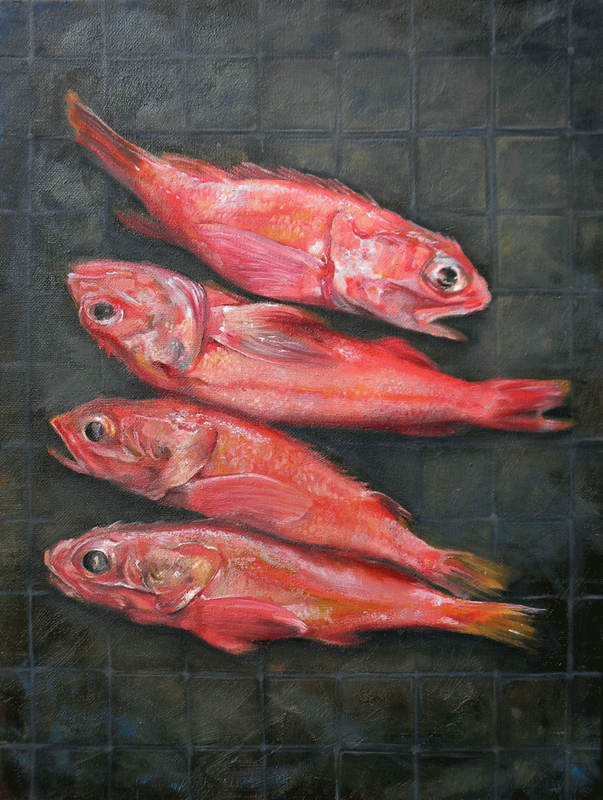 Morning Fish features four bright red fish with semi-transparent skin, laying on a dark tiled surface. It is an experiment in using pattern and form to unite subjects from both familiar and unfamiliar worlds. I refer to these worlds as, respectively, world-for-us and world-in-itself. These names are in reference to Eugine Thacker’s book, In the Dust of this Planet, in which he creates a model for understanding the world by separating it into three different parts. World-for-us is the first of those worlds. It can be described as the world that we, as human beings, interpret and give meaning to. On the other hand, world-in-itself is the world in its given state, without our interpretations imposed upon it. Pattern and texture are the main tool I use to explore the interaction between these two worlds. I believe that pattern and texture are fundamentally the same thing. The difference between them is their scale and complexity. Simple, easily digestible patterns, (such as tile squares and floral print), belong to the-world-for-us. Texture, on the other hand, is related to fractals. In the context of my work, I view fractals as complicated patterns which belong to the world-in-itself. They are aesthetically pleasing and most easily recognized through intuition. Therefore, I do not paint them explicitly. I attempt to represent them through the use of texture. In this painting, the texture of the fish skin is the most prominent subject. It stands in as the world-in-itself and is meant to be observed with a renewed realization of what it is. The square tiles in the background are a product of the world we have created for ourselves. Its simple structure provides a contrast which draws out the unique qualities of the fish.